Jack Parker grew up in the small township of Eustis, Florida where his family still has roots. He attended Furman University in South Carolina where he graduated Phi Beta Kappa with a degree in Chemistry. He then went on to Medical School at University of South Florida College of Medicine in Tampa, where he graduated Alpha Omega Alpha, top 5 in his medical class. Dr. Parker completed an internship in medicine at Orlando Regional Medical Center in 1985 and then returned to USF for his Ophthalmology residency. Dr. Parker moved back to Orlando in 1988 at which time he joined Dr. Thomas Bates in private practice. In August of 2009 Dr. Parker opened Parker Eye Center on Orange Avenue just south of ORMC. 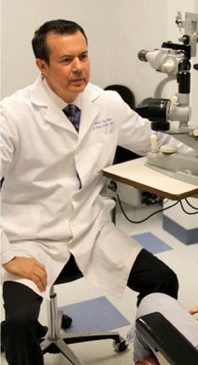 Dr. Parker is a Board Certified Ophthalmologist who performs general ophthalmology with a special interest in cataract removal, glaucoma and diabetic eye conditions. He also performs eye exams for glasses and contact lenses. Dr. Parker resides in Longwood with his two college age sons. He enjoys boating, fishing, working out, and he has a special interest in fast exotic cars.